Last year I planted garlic. Twice. At different times. In different places. Planted in full sun, part sun, shade, full shade. Guess how many sprouted? Not one! 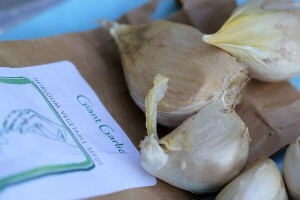 First I read on Alan’s blog that Garlic must be planted in Autumn if you want it to grow successfully. That was my first Garlic Ah ha moment. The second Garlic Ah ha moment came when I read a few weeks ago that the garlic we buy from our local super market is genetically modified to be sterile (so that if you plant it will not grow). That’s quite funny actually. Here I was faithfully planting the finest bulbs from my garlic purchases thinking they would give me wonderful garlic plants. They didn’t stand a chance. Now I know why. A bit of scouting around and I came across a South African site that sells Heirloom Seeds*. I spent quite a bit of time on the site and read their story which inspired me to try growing a few more veggies. (Note to self: but more pots for veggie plants). Each vegetable or herb featured on the site is accompanied by useful tips and instructions on when, where and how to sow, etc. Long story short, I placed a small order with them which arrived and I now eagerly await the weekend so that I can get outside and plant! I have to commend the guys at Living Seeds. I’ve bought quite a few seeds and gardening things online. Ordering was fast, secure and communication was great. 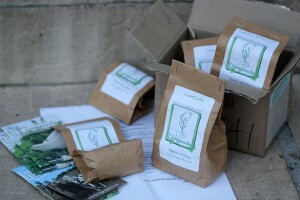 The seeds arrived in the post (it took ten days from Gauteng to Cape Town, but that’s the SA Postal Service for you!). 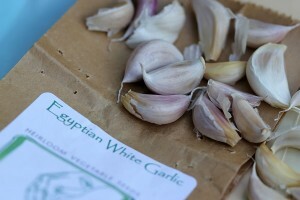 They were beautifully packaged and arrived with more printed info and tips again on how to get the most from my garlic seeds. Best online seed buying experience by far! The instructions for planting times are pretty clear. The Egyptian garlic should have been planted by the end of March and the Giant or Elephant garlic should be planted out by mid April. 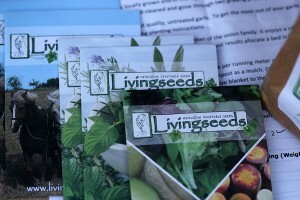 * Heirloom Seeds (definition courtesy of www.LivingSeeds.co.za) Heirloom vegetables can be simply defined as any plant that has been handed down from generation to generation. However there is much debate and discussion between various organisations and bodies that try to place limits and stipulations as to what defines an heirloom plant. We believe that any plant that is firstly open pollinated, secondly has a history of private exchange and thirdly has not been subject to a plant breeders rights claim to be worthy of heirloom status. This definition is however not cast in stone and is open to constructive discussion. ** Please note that this is an unsolicited review. Living Seeds are not aware of my intention to blog about this order and I paid for my purchases like any normal customer. 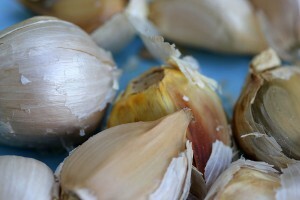 I need to have a contact phone or e.mail address of where to order garlic seeds from. Is there any one out there to provide the information? excited to have discovered this incredibly interesting page on the internet. 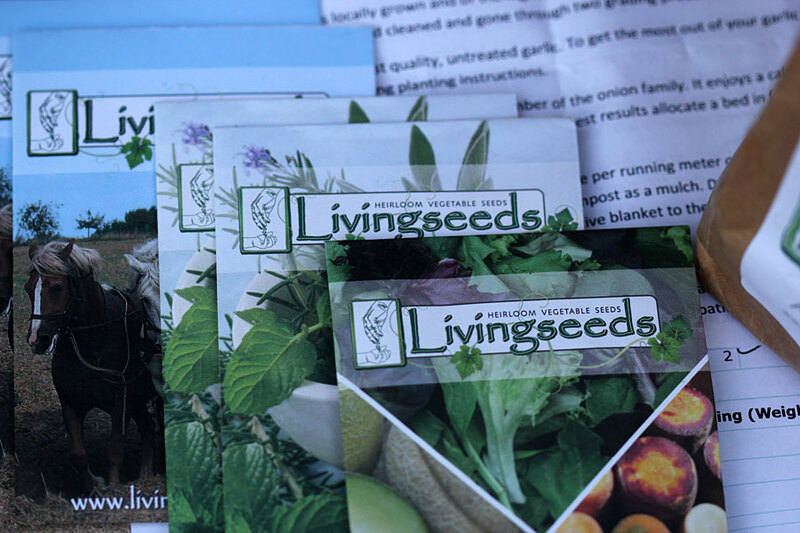 Hi Celia – You can find all the details for this company on their website which is at: http://www.LivingSeeds.co.za – They are very good! I highly recommend them. What a GREAT post – I am also a fan of Living Seeds!! I have also pulled out all my seeds – the ones I collected and the balance of last seasons seeds are plentiful. This is what nature intended – for life and food to be plentiful and not for the self-made few to get rich. I will also add to this post! As a limited full sun, mostly flower gardener, I still find a place for all kinds of herbs and a pot or two of something veg each year that I have to grow… this year its pimentos. Yeah, weird, but heck, I’m going to have plenty I suspect, all from a few local seeds. Its so cool! The other true heirloom I have which reseeds itself each and every year by itself is 4 oclocks I collected from my mom’s garden who planted a row some 30 years ago. And I suspect, should I leave tomorrow and the next owner never garden…they would still be here 30 years from now reseeding themselves. Good luck with your garlic now! I try to use heirloom seed, and saving seeds is an adventure in itself! I only buy heirloom seeds. 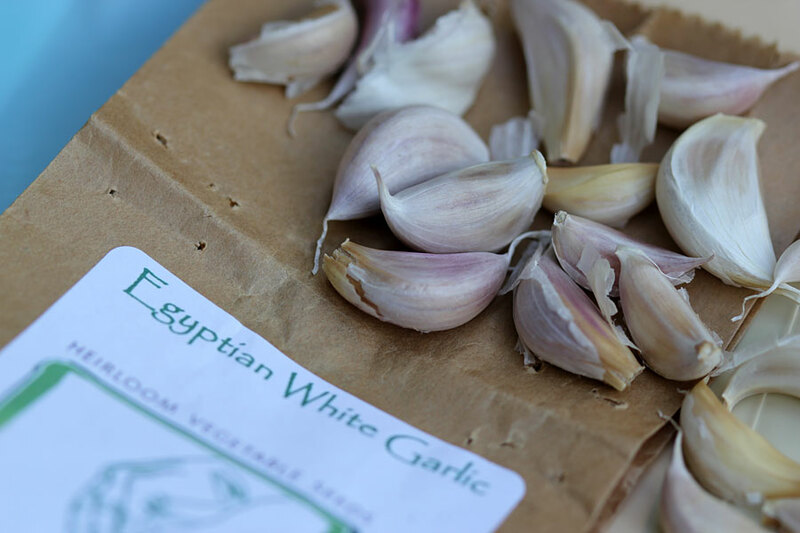 The good news about your heirloom garlic purchase is that if you save a few cloves from your harvest, you can replant them. At least in our climate, garlic is one of the simplest plants to grow — almost nothing to do with them from planting until harvest (from what I’ve read, as I haven’t had my own harvest yet). I admire your persistence and like the choices you made. I love the company’s attitude about saving some seed for next year — refreshing! I’ve bought from them too – they’re fantastic! 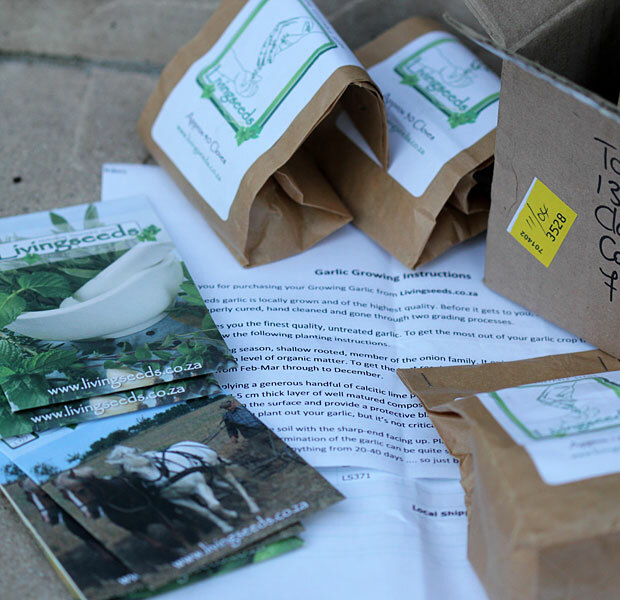 I can also highly recommend Linda at Sought After Seedlings (http://www.soughtafterseedlings.co.za) She imports, and supplies, the heirloom Franchi Sementi seeds from Italy, and has an amazing range of seeds. I especially loved the purple beans, which turn green when you cook them – but raw, sliced purple beans in a salad are brilliant. If you sign up for her newsletter, she will inform you (via e-mail) on what to plant when. 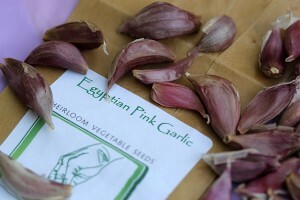 I have purchased seed from both Sean and Linda and am very happy with both suppliers.